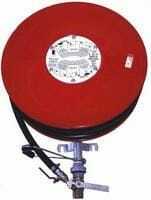 Firex Fire Hose reels are complete with 36 metre Fire Hose and have side plates in mild steel, painted signal red. The Fire Reel Hose is P.V.C with 19mm internal diameter. The nozzle is a jet lever action brass with a swivel zinc plated guide arm. 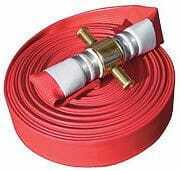 This is the typical hose used for fire fighting applications. It is made from woven polyester and is lined on the inside with synthetic rubber. 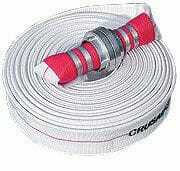 This “canvas type” fire hose is rot proof and does not require any drying after use. This hose is light weight and flexible making it easy to roll up and store in a compact box. This hose can also be supplied in a kit form including nozzle and couplings. Sizes from 19mm to 102mm internal diameter and lengths up to 300m continuous. This hose is similar to the Excalibur but it has an exterior coating. This polyurethane coating is usually red in colour and it helps prevent the hose being stained by oil and dirt as well as enhancing abrasion resistance. Other coating colours are available subject to minimum order quantities. 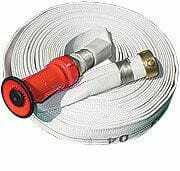 This lightweight super strength hose is recommended for industrial and commercial fire protection as well as for general usage on mines and farms. This is a high pressure fire hose which is also maintenance free. 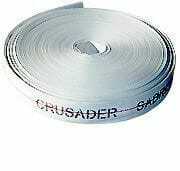 Used mainly by fire brigades who require a Class H (5250kPa) bursting pressure hose. 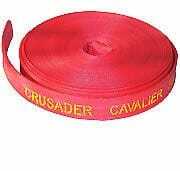 This hose carries the approval of the Australian Army (DEF 5195 A) standard. This light, compact forestry/bushfire - fighting hose is constructed from abrasion - resistant, high strength synthetic fibres, forming a durable and easy to handle hose. The liner is extruded from light weight elastomer which is designed to allow precision engineered seepage of water under pressure to the hose jacket. This self protecting feature forms a barrier against the effect of heat and glowing embers. The 100% synthetic construction affords excellent mildew resistnace making this hose ideal for areas utilising harst water. No drying is required.